LUCY BURDETTE: today was supposed to be our new Red Susan's day to strut her stuff. But she got waylaid--it's an incredible story and she'll tell it all next week. So today we're talking about what we're reading, and we'd love to hear your recommendations too! I just finished Kristan Higgins's new romance, THE PERFECT MATCH. She's brilliant at swoony but not gooey love stories with fully-fleshed out characters. I'm always sad to see one end. And now my bookmark is in Sujata Massey's new historical novel, THE SLEEPING DICTIONARY. So far it's about an Indian girl whose home and family is wiped out by a tsunami, and also about India's fight for freedom. I loved Massey's mysteries set in Japan, so I'm betting this will be a great read too. HALLIE EPHRON: I just finished THE SILENT WIFE. 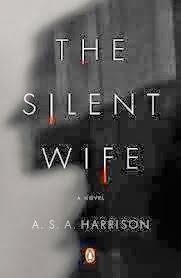 Everyone said, if you liked GONE GIRL (and I did, very much) then you'll like THE SILENT WIFE (I did.) Less nasty and just as wicked, it tells the story Jodi and Todd in a "perfect" marriage. They live in a lovely home where she makes lovely meals and he mixes her perfect martinis. A psychotherapist, all day long Jodi listens to self-deluding patients, all the while in a state of denial herself as she puts up with being married to man who is "not good at monogamy." Until she snaps. Also reading ORPHAN TRAIN by Christina Baker Kline and loving it. There are two linked stories -- one tells of the friendship between a 91-year-old woman and a 17-year-old alienated foster child who is sentenced to community service work for stealing her favorite book from the library. They are both orphans. The second story is of an Irish orphan girl shipped west, as so many children were in the late 20s, in nearly Dickensian circumstances, in the hope of finding a family and a future. RHYS BOWEN: I wish I could tell you what I'm reading, but I can't, because once again I'm chairing an MWA contest and I can't tell you anything about it. But I can tell you that the submissions start at a trickle and by the deadline they turn into a flood. So reading away at things that are not always my cup of tea and looking forward to picking up my TBR pile that has Julia's new book at the top of it. 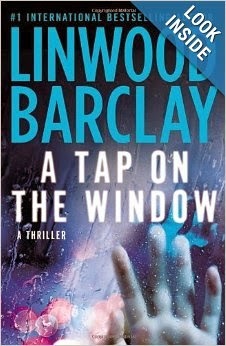 HANK PHILLIPPI RYAN: I am reading Linwood Barclay's A TAP AT THE WINDOW.Reds, he is SO fabulous. It's sinister, but possible-- realistic but creepy, normal-with-a-twist. Exactly the kind of book I love. I want to be him when I grow up. 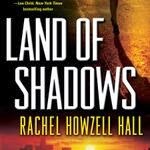 Rachel Howzell Hall's LAND OF SHADOWS--tough, gritty, smart, so original. A book to watch out for: ICE SHEAR by MP Cooley. A terrific main character in a debut that's seamlessly natural! Watch for it. I also read a soon to be published manuscript by Marilyn Levinson called MURDER a la CHRISTIE, which is adorable. Go, Marilyn, and good luck! 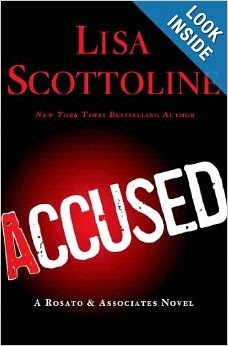 Finally, I sat down to read a couple of chapters of Lisa Scottoline's ACCUSED--and never got up. It's a page-turner, and pure wonderful Lisa. is an American who lives in London and sets her stories in--are you ready? Minnesota. I think there is a little irony where I am concerned, but this is a great, polished read, with a female detective readers will love. And if you thought Julia's Through the Evil Days made you feel cold, just wait for this one! 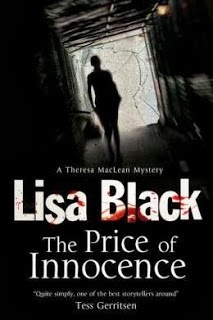 Now I'm reading the new Theresa Maclean novel, The Price of Innocence, by Lisa Black, who will be our guest on Tuesday. I love this series, so this is a real treat. I am soooo far behind . . . my to-be-read pile is a mountain and I am desperately wishing for more reading time than I seem to have these days. I’ve just finished a re-read of Julia’s wonderful “Through the Evil Days” and now I’ve put aside Archer Mayor’s latest Joe Gunther story, “Three Can Keep A Secret” long enough to write this, but I’ll finish tonight and then it’s on to Allison Brennan’s “Cold Snap.” And Wiley Cash’s mystery/coming of age story, “A Land More Kind Than Home,” is on my eReader. Dana King stuck his Stark House Press novel GRIND JOINT in my hands at Bouchercon. I finished it the next week in the airport on my way to SeaScape. Two small town Pennsylvania cops -- cousins -- take on the Italian mob, the Russian mob, and their own crooked police department. Great dialogue, great read. Elmore Leonard fans like me will love it. Reading Donna Tartt's GOLDFINCH. (At more than 700 pages, it's taking me some time.) I'm loving it. Beautifully written, lush prose, the "telling details" abound. The characters are fully-fleshed and have me hooked, but good. I have no idea where the story is going, which is unusual these days. Is it too long? In need of editing? Maybe, but I don't care because I'm happily, languidly immersed. It's a totally different reading experience than what most of us--I bet--are having these days. I'm reading Claire Messud's "The Woman Upstairs" and am confused so far but enjoying the voice and the allusions to what happened. On a recent trip I read several mysteries, including Harlan Coban's "Tell No One" (thriller extraordinaire), Hank's "Prime Time" (she was great from the start), and Julia's "In the Bleak Midwinter" (I love this series and am so excited to be at the beginning!!!). Hallie reminded me of what I find when I am looking for an audio book at the library -- the first sentences of the synopses so often start -- "Theirs was a perfect family/marriage/life." I spoke with a panel last night at my library (Yay, Milton Library!) and talking about books for Xmas gifts. And lots of folks there were recommending GOLDFINCH. Donna Tartt: A writer who takes (at least) 4 years to write a book is a writer after my own heart. I recently finished reading Donna Tartt's THE GOLDFINCH. Then I suffered a bit of "book hangover." Nothing I picked up was the least bit interesting because I was still living in the world of THE GOLDFINCH. I loved it. LOVED IT. I know there are going to be people who hate it. They'll say it was too long, could have been edited down to half the length, etc. etc. But. I love big books, I cannot lie and I embraced every word, every detail. But I started reading Craig Johnson's THE SPIRIT OF STEAMBOAT, and it was just the thing. A wild and bumpy ride that left me breathless. Women writers--my preference, for sure. Although I recently read Lou Berney's Gutshot Straight and immediately wanted to read the next one. Right now I'm reading Alistair Burke's Angel's Tip. I normally stay away from fem-jeop stuff, but I know her from another blog and this book has been on my Nook for over a year. So far, so good. It was a good one to read on the plane coming back from Miami, where we celebrated my youngest daughter's PhD in microbiology!! These all look amazing. I just finished Tasha Alexander's Behind Shattered Glass. Perfect time to go mystery shopping agian. I'm reading The Silent Wife at the moment. I also loved Gone Girl and am finding this to be excellent. I'm about halfway through and looking forward to more of the story as it unfolds! Can't wait for THE GOLDFINCH--everyone is talking! Aw...Denise Ann. Thank you for your kind words about my dear PRIME TIME.. That is..so wonderful of you. And there is nothing, NOTHING, more important than happy readers telling other readers why they're happy! I'll put The Goldfinch on my list, but right now I can't imagine finding the time to read a 700 page novel. Sigh. I'm reading a promising exploration of the historic roots of the King Arthur legend--Sean Pidgeon's novel, Finding Camlann. If I stop and consider for long how far behind I am in my reading, I would be in a right panic. The catching-up for the Reds' authors alone is quite daunting. I managed to read Julia's Through the Evil Days last week, which was as thrilling as I had thought it would be. I had to find out how the pregnancy was affecting Clare and Russ. Julia always gives an amazing story. I have on my urgent TBR list (isn't everyone's TBR list divided into categories?) the rest of the Molly Murphy series, which I started right before Bouchercon, the rest of the Key West mysteries, Hank's latest, more Hallie, and to start on Rosemary's and Susan's books. Of course, I've marked the calendar for Deb's next Gemma and Duncan. This group is so talented that I think a reader has her work cut out for her trying to keep up. Today, I'm starting Laurie King's latest, The Bones of Paris, which I'm embarrassed that I haven't gotten to yet. I'm a newly minted member of Laurie's FOLs and had dinner with her at Bouchercon, so I feel especially guilty about catching up there. Also, on my urgent list is Jamie Ford's latest, Songs of Willow Frost; Lyndsay Faye's The Gods of Gotham and Seven for a Secret; Peter May's The Chessmen and The Lewis Man; Sena Jeter Naslund's latest, The Fountain of St. James Court; Alan Brennert's lates, Palisades Park (really should have gotten to this one already, his other books Molokai and Honolulu are brilliant); Scott Turow's new best seller, Identical; Amy Tan's new one, The Valley of Amazement; highly recommended to me, The Husband's Secret by Liane Moriarty; Diane Setterfield's new ghostly story, Bellman & Black; John Grisham's Sycamore Row; and a book I won and am anxious to read, The Rathbones by Janice Clark. The above titles are on my TBR list for 2013, but there are even more books on the list. I haven't included the young adult or teen lit that I like to read, which has been rather neglected this past year. I am finishing up Liar & Spy by Rebecca Stead today. Do you think maybe I went a little beyond the question in my answer. LOL! I learn so much from you all. I'll admit that right now I'm reading Lisa Kleypas' TEMPT ME AT TWILIGHT. My hidden vice is reading historical romances. Shhhh. Don't tell anyone. Also, I have started PRINCESS ELIZABETH'S SPY by Red Susan and A FATAL WINTER by GM Malliet. I'm rereading SHADOW OF NIGHT by Deb Harkness in "real time" as we approach the release of the third book in the trilogy. This will take months. And on my side table are Terri Austin's two books, DINERS, DIVES, AND DEAD ENDS and LAST DINER STANDING. Can't wait to get to those. Big apologies to Karin Salvalaggio! 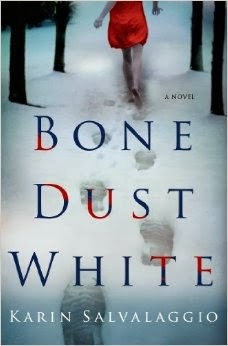 Her book is set in Montana, not Minnesota! I certainly knew this, but was thinking that her book would appeal to William Kent Krueger fans, and my brain slipped a gear. Her book comes out in May, by the way, and I'm looking forward to having her on JR. I'm reading Geisha by Liza Dalby - she is the only non-Japanese woman allowed to be trained as a geisha - fascinating look at life in Japan. Just finished re-reading Red Hank's THE OTHER WOMAN and THE WRONG GIRL in order to interview her while she was here. What a pleasure! Having her here, interviewing her, and re-reading her books! Now, I'm reading Elizabeth George's JUST ONE EVIL ACT. 700+ pages. I've heard from some that she needs editing in this book, but so far (about 50 pages in), it's reading like classic wonderful Elizabeth George. Kathy Reel--you are amazing! Applause, applause..
And LInda, thank you--your questions were fabulous and I cannot wait to hear the interview...and read YOUR new book! Jill, I will have to look Geisha up. I love fiction set in Japan. And The Goldfinch, sounds like a must read...and also Wally Lamb's new book. And Ann Patchett. And Marianne in Maine, don't you dare apologize for reading romance. Tons of great writers in that genre! I'm so glad you enjoyed reading my mystery, Murder a la Christie, which is coming out in February. I'm reading Mrs. Poe by Lynn Cullen, and enjoying it. I had to put down Donna Tartt's Goldfinch to read when I have more time. Lucy and Hank, it is a list of epic proportions. LOL! I do want to emphasize again how enriched my reading life has become by all the authors in this group. If I haven't yet read all of your books, it doesn't mean that I value your works any less than others. It simply means that I want some solid reading time to devote to your books and haven't had it yet. There are just some authors (all of you) that I don't like reading while busy with too many other things. I want complete emersion when I read you ladies, so I must pace myself.